Bald Eagle. Bird Watching Bald Eagles. Description - The Bald Eagel is a large eagle that is a blackish colour with a white head and tail and a heavy yellow bill. The call is a squeaky cackling with thin squeals. 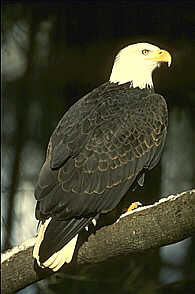 Distribution - The bald eagle breeds from Alaska east across Canada and south to California. Winters are spent along coasts and large rivers in much of the United States. Bald eagles inhabit the lakes, rivers, marshes and seacoasts in British Columbia. Biology - The nest of bald eagles is made of sticks in a tall tree or on top of a cliff; here 2 or 3 white eggs are laid. This bird is primarily a fish eater but also eats carrion and crippled waterfowl. This beachcombing habit has contributed to its downfall, as it accumulated pesticides from contaminated fish and wildlife. Hunting, poaching, and the encroachment of civilizations have also reduced the population of bald eagles greatly although an intense recovery plan appears to be increasing its numbers.